Can you spot any differences? There is less neural activity in the depressed brain. So, what's going on? Why is this happening? Depression is the routine activation of certain brain circuits, which we all have, in specific patterns that result in depressive symptoms in a person. The flow of traffic through a city is complex and dynamic – sometimes jamming up inexplicably and other times flowing smoothly, even at rush hour. The stock market and larger economy follow similar patterns as does the weather and even pop culture. Mathematically, these types of complex dynamic systems share many similarities, including the way the whole system — whether a traffic jam, a tornado, a recession or recovery, a viral tweet, or the next fad — can get caught in a runaway pattern: either an upward or downward spiral. So why do tornadoes happen in Oklahoma but not in New York? Because conditions are just right — the flatness of the land, temperature changes, humidity, and wind direction and speed. But there’s nothing wrong with Oklahoma. The same is true of your brain. In depression, there’s nothing fundamentally wrong with the brain. It’s simply that the particular tuning of neural circuits creates the tendency toward a pattern of depression. It has to do with the way the brain deals with stress, planning, habits, decision making, and a dozen other things — the dynamic interaction of those circuits. And once the pattern starts to form, it causes dozens of tiny changes throughout the brain that create a downward spiral. That might be hard to hear, but it’s true. Complex systems, like your brain, are influenced by tiny fluctuations. This explains why on some days there’s a traffic jam and on other days cars flow smoothly. It explains why some YouTube videos go viral, and others remain in obscurity. And it explains why you feel great on some days and crappy on others…. Changing the timing of a single stoplight may cause or prevent a traffic jam. A YouTube video may go viral from a single tweet. And sometimes tweaking the tuning of one brain circuit can start to reverse the course of depression. 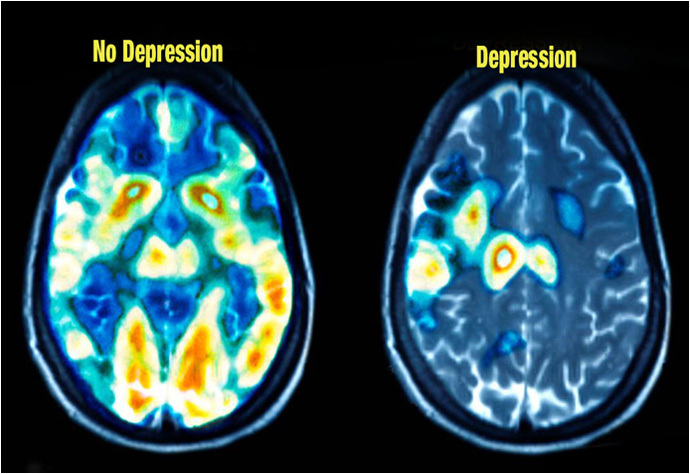 When looking at the depressed brain vs normal brain, we all have the same basic brain structure although the neuronal connections, determining the activation of and communication between brain circuits, are unique to every person. The particular circuits excited over and over in your brain become the go-to default pattern for you and are the product of your thoughts, interactions with others and the world, and the events that happen to you. In the 1960s, we were told depression was due to a deficiency of the neurotransmitter norepinephrine. Then, a still popular theory blamed depression on too little serotonin. Today, we know that it’s much more complicated than either of these and involves many other neurochemicals which influence and are influenced by depression. (For example: dopamine, oxytocin, GABA, melatonin, endorphins, endocannaboids) To oversimplify, each neurotransmitter tends to contribute to a particular depressive symptom. How do we get depressed? Genetics – Genes aren’t your destiny by any means, but they do guide the initial development of your brain circuitry. You can inherit a brain more that’s more likely to become depressed. Research has determined that there’s a genetic component to depression and that as much as 40% of people with depression have a genetic link. If a person has a parent or sibling that has had major depression, they are three times more likely to develop the condition which may be due to both hereditary and environment. Women have a 42 percent chance of hereditary depression, while men only have a 29 percent chance. Early Childhood – Your childhood experiences literally shape your brain. While genes supply the basic blueprint for brain development, experience tweaks brain circuitry, and young brains in a critical window of development are particularly sensitive. Stressful or traumatic events in childhood and adolescence dictate the development of neural circuitry and influence the levels of chemicals released in the brain having powerful and lasting effects. The prefrontal cortex of the brain doesn’t finish maturing until a person is in their twenties and is susceptible to stress the whole time. Stress – The current level of stress in your life is a big factor affecting which circuits are activated in the brain. Stress can disrupt a person’s healthy behaviors starting the brain on a downward slide. For example, stress at work can lead to working longer hours, which leads to missing exercise and yoga for weeks and not hanging out with friends or having much time for your partner which puts you in a funk and causes troubles in the relationship which only leads to more stress which means losing sleep and binge eating etc… You get the idea. Recent research has also shown that chronic high stress kills neurons and prevents the birth of new brain cells in a region called the hippocampus which is necessary for a healthy stress response. Social Support – Humans are social beings who need each other and are meant to be around other people. Numerous studies have shown that close relationships protect against depression. In research, low self-rated social support was associated with higher levels of anxiety and depression. In another study involving depressed college students, lack of perceived social support, described as feeling unappreciated, unloved and un-involved with family and friends, proved to be one of the most powerful predictors of persistent suicidal thoughts, even in the absence of other risk factors. During tiring times like this, using an alarm clock can be most helpful. Set your alarm in the morning so you don’t end up staying in bed all day long. If you have an important meeting to attend, or an appointment, set your alarm as well. A constant reminder of your daily tasks can keep you motivated to do what you have to do. Take a long, cold shower, brush your teeth, apply makeup, and wear a pretty dress. Even if you just work from home, dress up! Doing this decreases your urge to lounge because again, you are reinforcing in your brain that you are getting ready for something. Sweating it out is one way to boost your motivation and get your body going. Choose an exercise that works for you. You don’t have to force yourself to do an intense workout. You simply go with walking, swimming, running, or gardening. 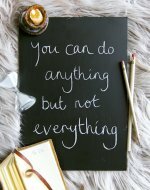 Schedule your tasks according to your energy levels. If you think you have more energy in the morning, you may want to do tougher jobs and reserve the lighter ones in the afternoon. For bigger projects, consider creating a timeline of at least one or two weeks (more if necessary). Break a big task to smaller ones. And don’t forget to incorporate activities that give you pleasure, such as your hobbies and passion. Being with people you love, including your friends and family is one way to boost your mood. And when you’re feeling good, you are more likely to motivate yourself to hit your daily goals. Remember that the more you remove yourself from the environment of depression, the better your chance of recovery.